So, I can’t sleep (again…sigh). My mind just won’t turn off. I’m trying to figure so many things out. I feel like there is so much I want to do, but the timing isn’t right, financially I’m not prepared, I haven’t perfected that thing yet and I need it to move forward…and on and on goes my list of excuses. So I decided to study my bible and journal a little bit to clear the noise in my mind. I opened my bible and it went right to the book of Jeremiah, 29th chapter. 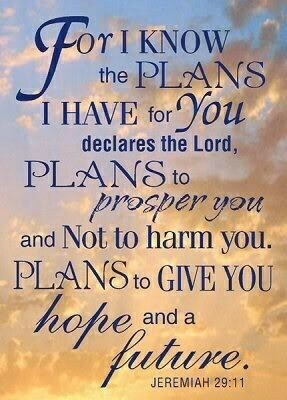 Now, Jeremiah 29:11 is my FAVORITE verse. It is my go to verse when I’m questioning everything happening around me. I stand on that promise when questioning my future. But tonight, instead of reading the promise, I could hear God whisper to me to read the work before the promise. There were things in the valley that needed to done while waiting on God to give them prosperity. Sometimes we look only at what we want from God. The peace, the prosperity, the blessings falling from heaven overflowing our cups. But we don’t want to do the work. We don’t know how to wait. We don’t enjoy where we are now because we are looking toward where we desire to be. A farmer must prepare the soil, plant the seed, water the seed, pull weeds then harvest his crop before he sees the fruit of his labor. It is not an overnight process and it’s not always easy to wait. Stop waiting for perfect conditions to plant your seeds. God says make the place you are in now prosper! Don’t complain that you don’t have enough clients or knowledge or money or exposure. Don’t sit in misery waiting for a better time. The moment is now. GET TO WORKING ON YOUR PURPOSE! Don’t wait until you get to where you want to be to start. Start now where you are to get to where you want to be. Tags: contentment, Jeremiah 29:11, patience, perfect timing, plans, waiting. Bookmark the permalink.